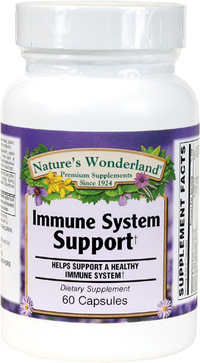 Immune System Support, 60 Capsules (Nature's Wonderland) - Penn Herb Co. Ltd.
Our immune system is an amazingly intricate network that protects our body against threatening pathogens. 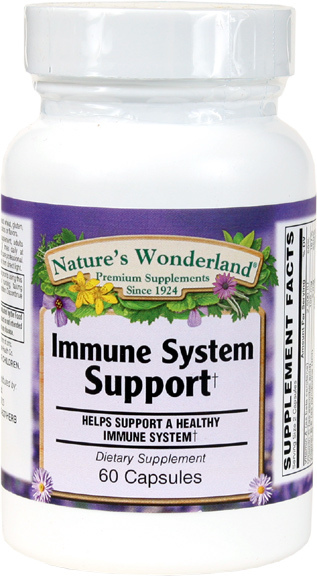 Mount a good defense with Nature's Wonderland Immune System Support formula! It blends time-tested herbals extracts, vitamins, and mushrooms to support healthy immune system function. Echinacea, Goldenseal....centuries-old wellness herbs provide unparalleled support for healthy immune response. Astragalus Extract... traditional Chinese root supports healthy white blood cell activity. Maitake, Shiitake, and Reishi Mushrooms...nourishing immune tonics support natural defenses, while helping the body adapt to stress (which can adversely affect immune function). As a dietary supplement, adults 2 capsules, three times daily at mealtime, or as directed by a health care professional. SEE PDF LABEL FOR CAUTIONS.